The Google Doodle is part of the digital landscape, but at an elementary school in the Inner Richmond, a version of the tech giant's logo has become, as they say in Silicon Valley, brick-and-mortar. 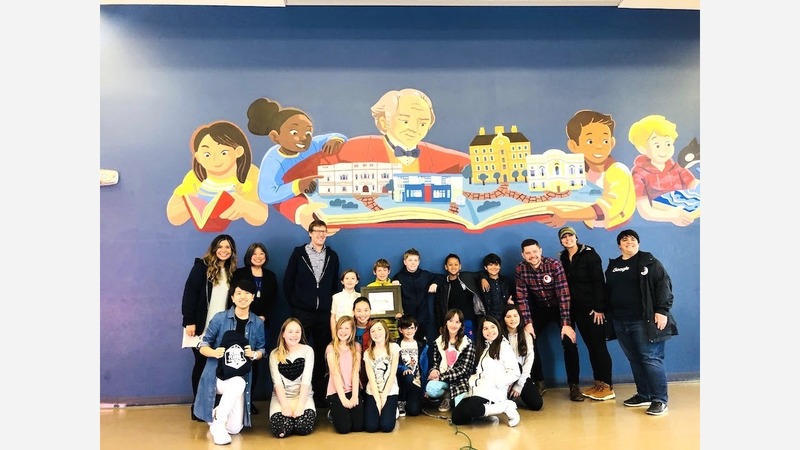 A mural depicting a Google Doodle that honors the namesake of George Peabody Elementary School was revealed this morning in the school's cafeteria. Considered by many to be the "father of philanthropy," the work was installed by the Doodlers, a team of volunteer artists on Google's Doodle team. Peabody, who was born in Massachusetts in 1795, achieved success as a financier, eventually accumulating a fortune worth $16 million at the time of this death in 1869. At the time, his holdings were worth approximately approximately 1/556th of the nation's gross national product, according to Wikipedia. Over his lifetime, he funded libraries, scientific institutes, affordable housing and an Arctic expedition. "One of our primary goals for all Peabody students is that they gain a love of learning and curiosity for the world," said Principal Willem Vroegh, who said the school strives to cultivate the same traits in its students. "Seeing a mural on our campus and the Google homepage that honors our namesake and school is a great way for our students to be reminded of those values," he said. District 1 Supervisor Sandra Lee Fewer said Peabody's "social and political activism" reflect San Francisco's values. "I am so proud that the students and future leaders at George Peabody Elementary will be celebrated on the Google homepage for their commitment to making our city and world a better place," she said. Becayse Peabody was awarded the United States Congressional Gold Medal on this date in 1867, today's doodle will appear to Google users in 28 international markets. The company adapts its logo to celebrate notable "holidays, people, places, and historical and cultural moments."